Today I have an awesome video tutorial for you. 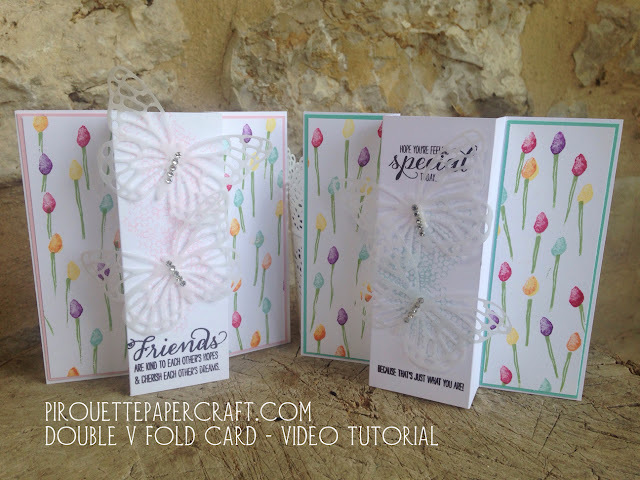 First watch how to create this beautiful folded card and secondly I show how to recreate some Stampin' Up! Painted Blooms DSP that was retired back in June. I showed a card in this blog post that used this fold and the DSP and was asked how I created it. Somewhere out there on the Internet is the tutorial for this card and I thought I had it pinned to my Pinterest boards, but alas no! I have searched and searched for the original tutorial I followed, I cannot find it so I've recorded my own and I hope you find it useful. I love the Painted Blooms paper so much and was disappointed that it retired so I decided to have a go at creating something similar. I used the current Stampin' Up! stamp set Garden in Bloom. Thanks for watching and next week's video is layer stamping the small butterflies on Watercolor Wings - so remember to subscribe using the links on the right sidebar so as not to miss it.